I got on an overnight bus south at 6pm-ish and spent about 12 sleepless hours on it. At least I had two seats to myself, so I could curl up against the window and get semi-comfortable. We stopped around midnight at a shop that clearly caters to the tour buses. I got a bowl of slightly overpriced noodles and wasn’t disappointed by them. We stopped again at about 5:30am and sat around for two hours waiting to switch onto another bus to take us 20mins down the road to catch the ferry. I spent the time chatting with some randoms I’d met on the trip – an Indonesian girl and a Japanese couple. (Funny how from a full tour bus of foreigners I end up hanging out with the only non-westerners?) Sat with Sul at the front of the bus down to the wharf, where she got on a ferry for Koh Samui and I waited with most of the group for the ferry to Koh PhaNgan. Koh PhaNgan is known for its full moon parties, and as we were only two days from full moon, you can guess why we were all headed there! The ferry trip wasn’t too long – maybe 2 hours? It was a big boat carrying a bunch of vehicles across to the island along with all the passengers. I jumped on a full taxi (read: covered ute with bench seats for passengers down each side) headed to Ban Tai beach and was dropped off at Dew Shore bungalows. The places was a haven of palm trees and green grass, dotted by white bungalows with green rooves. I found the manager, but he wasn’t sure which bungalow carla and her friends were in. He said something along the lines of “go knock on that one, I don’t know who’s there so it’s probably her”. I wandered over with some trepidation, but on seeing what was clearly her laundry hanging out the front I stopped worrying. She wasn’t there, though, so I grabbed my book and hung out for a while. It turned out we had a bungalow with two double beds for the five of us, and it seemed to work out pretty well. Certainly the most sucessful bed-sharing Carla and I have ever done. I did manage to get a lovely mark on one knee from hitting it hard against the wall during the night, though! Anyway, that afternoon we headed to the pool which was LOVELY! Not cold at all, no matter what she said :P That night we went into Thongsala to grab a bite at the markets – but it started raining, more and more heavily, before we could even flag down a cab! Finally we got one, although we were all a bit wet once we got there – my bum was still wet from sitting on the bench when we got up from dinner an hour later! We ate in a little cafe instead of at the market cos of the rain, but we went and had a quick look at it afterward. Then we went to another little place to get some dessert – really lovely chocolate mousse! The girls went on to a Muay Thai fight, but I went home cos I was exhausted and wanted to get some rest before the next night’s party. As it turned out, the fight was a disappointment. 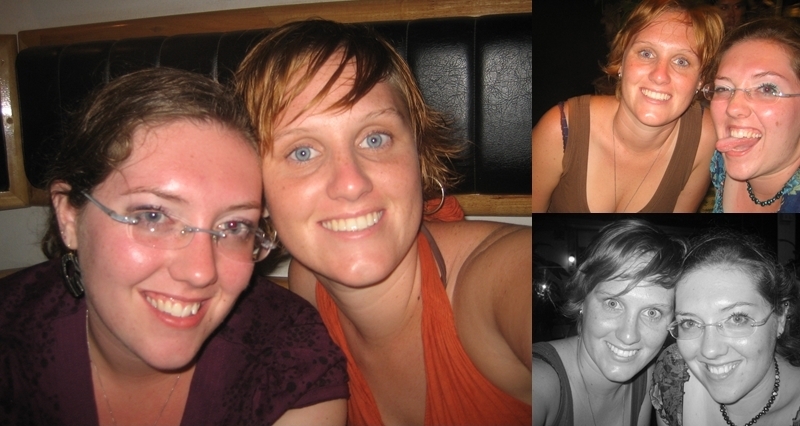 Carla had been training in Muay Thai (a form of thai boxing) for two weeks on another part of the island with a friend of hers from work back in Sydney. A friend they made there was supposed to be fighting but he wasn’t there and neither were their friends – so they were quite put out. On Friday we headed up to Haadrin, got some lunch and worked out travel arrangements for our various next steps. The other girls went to get massages/facials etc., but Carla and I decided to go back to Dew Shore for some rest. We went down to Haadrin beach first though, just for a quick look – that’s where the party was to be that night. We also stopped to buy a crepe with butter and nutella – really yummy! Although Carla assures me the crepes in Paris are better (funny that). Back at Dew Shore, Carla and I lounged around by the pool, mostly. I was feeling increasingly ill, though. 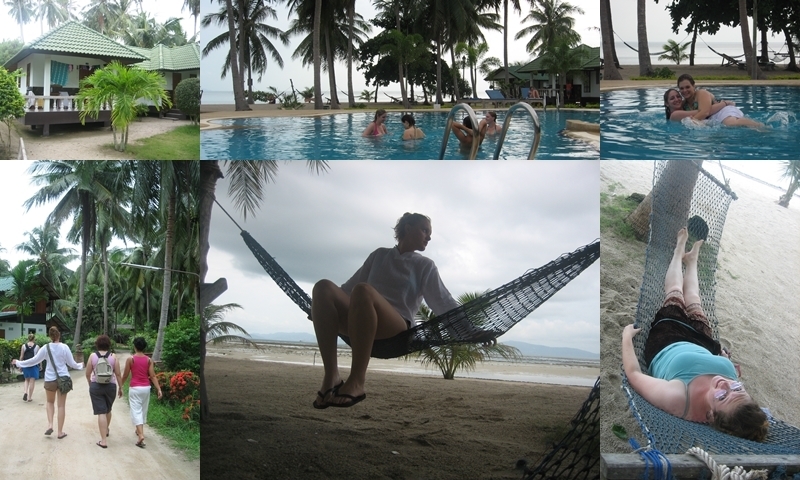 I’d been sick my last few days in China, and then in Koh PhaNgan started getting weird stomach cramps. I was trying to rest and relax for the party that night but I really wasn’t feeling well. I nearly stayed home but since the main reason for being there was the party I went up with the girls to Haadrin that night anyway. 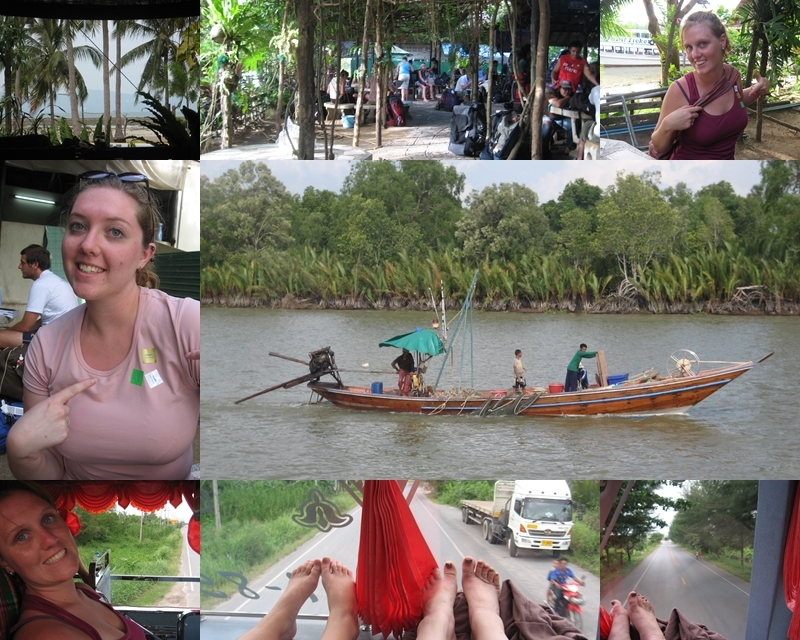 The taxis were all FULL heading to Haadrin and the full moon party – Carla and I squashed into the front seat with the driver and two of the other girls hung onto the back of the taxi all the way there. The atmosphere up there was really fun and lively – lots of places were setting up to paint designs on people in paints that show up under UV lights, and there were stores selling just about everything. We wandered around til we got to a restaurant with the fun triangular pillows seen all over the place there. Carla and her friend had been sleeping on them for two weeks at the muay thai camp and carla was planning to buy some in bangkok before we headed back to Australia. By the time it came to order I was feeling decidedly unwell and didn’t order anything but water. As we started walking back in the general direction of the beach I decided that I would give up and head home. It was a bit disappointing to miss the full moon party, but I didn’t mind too much – I’d been having fun and wasn’t going to continue having fun if I stayed out so I stopped to send a few emails then headed back. On the way I bought a crepe (a sort of consolation?) I ordered a “chocolate mars bar crepe” – the girl squirted chocolate sauce on it, then chopped up a fun-sized mars bar onto it. It was VERY good. That said, getting in the back of the taxi for the long and windy ride home I began to think it mightn’t have been such a good idea! It was fine though. The only hitch was the driver chattering away on his mobile and missing my stop – had to have someone bang on the window and yell at him. I’d been watching the road so we were only 30m past the entry so no big deal. I got home and settled in for the first of several two-hour long sleeps. I felt much better by morning, especially after eating breakfast. Carla and I were picked up by a taxi (a real van thing, although once again we shared the front seat with the driver as the back was full of luggage and other passengers) which was part of our combined tickets back to Bangkok. 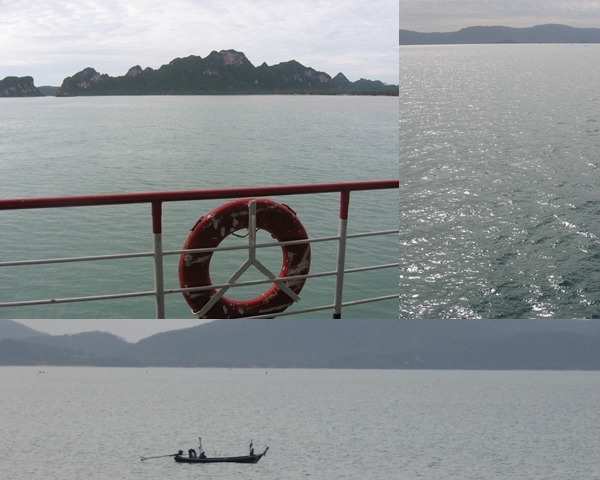 It turned out that I’d been on an odd ferry to the island – the one Carla had come across on, and the one we headed back on, was MUCH smaller, and for passengers only. We paid the small fee for the VIP room – air con and DVDs. 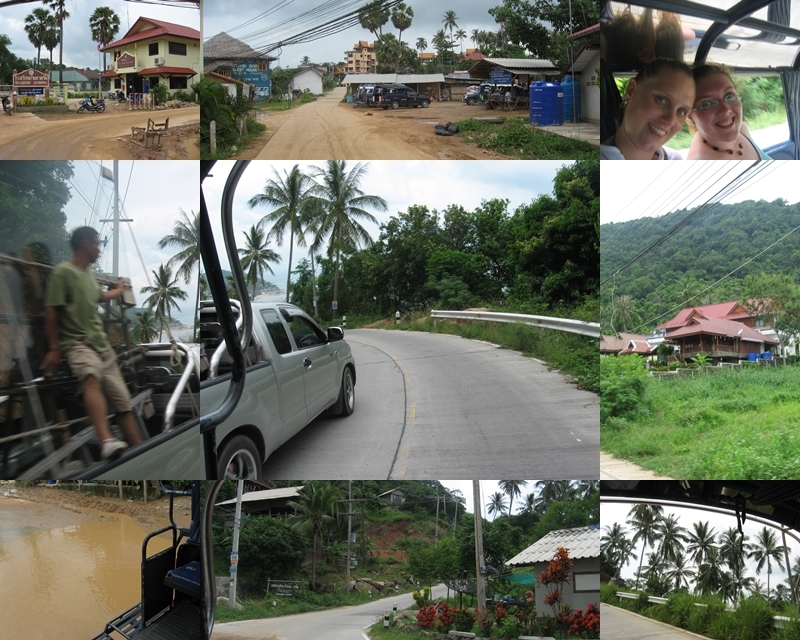 This trip, via Koh Samui, was about 4 hours long. After that we arrived at a small rest stop, where we waiting about two hours before boarding a bus back to Bangkok. The bus was packed, as the boat had been, with every seat booked. Carla rushed aboard first while I put our luggage in so as to secure the front seats for us. The tour buses are two levels, and the front-right seats up top are in the corner with some extra leg room. There was light for an hour or two so I got to see a little of the countryside which was nice. As with the trip down, I was stunned by just how many wide, full rivers there were. Sleep proved near impossible, but at least my ipod was working. Its battery was completely dead on my trip down – the alarm had gone on early in the day and as I hadn’t used it I didn’t notice so it played away happily until it ran itself completely out of juice! We stopped at the same roadside cafe-place, where Carla and I both got noodles. 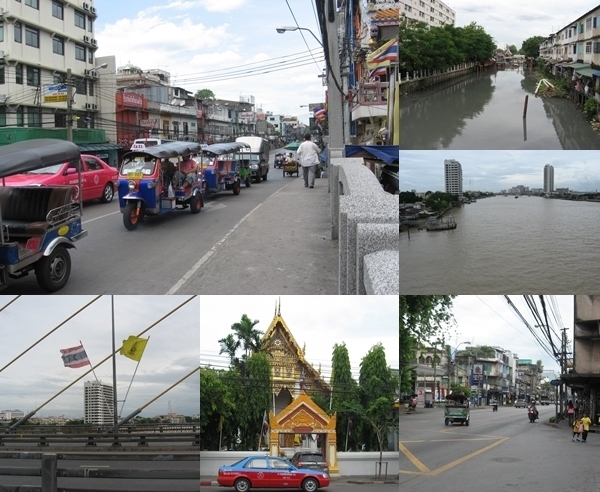 We arrived back in Bangkok around 5am and got a taxi back round the corner to the guest house, where we got ourselves a twin room with AC and promptly went to bed for a few hours! 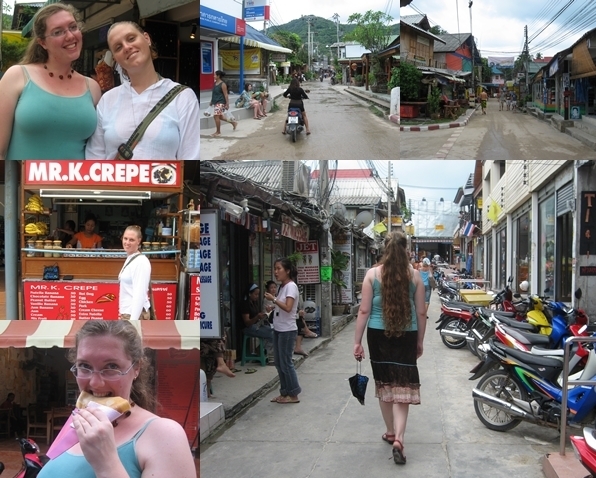 We wandered around Khao San a little and got some food, but we mostly rested, reading books and chilling out. We got some pretty decent Indian food for dinner but both felt pretty awful by the end of the meal. Seemed too quick to have been the Indian food, though – we blamed the spring rolls we got from a roadside stall in the afternoon. The next day we checked out about as late as possible, stuck our luggage in the back room and went off to MBK – a big mall Carla’s friend showed her when they’d been there before their muay thai thing. We window shopped a bit, got some cantonese food, did some actual shopping (I got some really nice jeans and a hair chopstick thing) and just wandered – lots of cool things to look at. 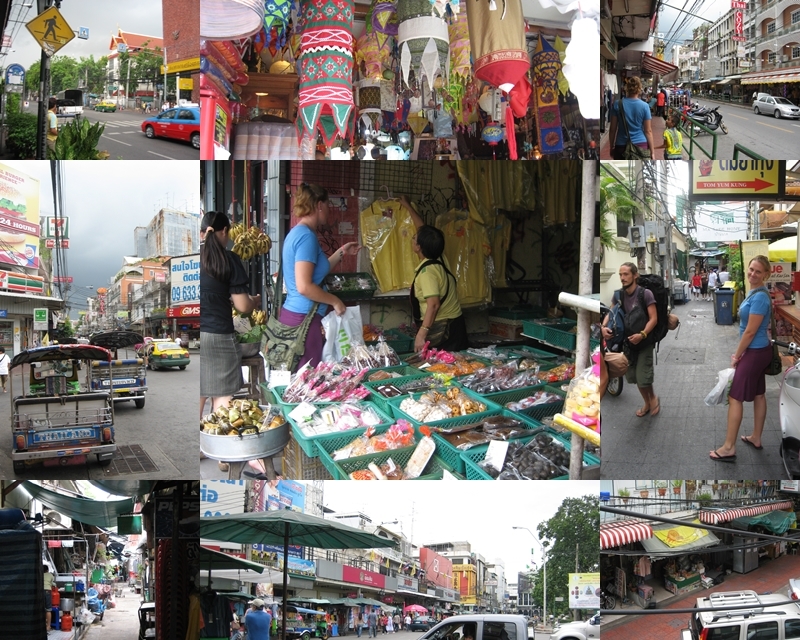 Grabbed some food and read our books and wandered a little more then headed back to Khao san for some final shopping. Carla bought her triangle pillows just around the corner from the guest house – and just as the rain that had been threatening for an hour really let loose! By the time we left we were walking out into a half decent thunderstorm. The rain was warm though, so I didn’t mind too much – it was a relief from the sticky humidity, really. We did get sopping wet, though. We sat in the lobby of the guest house reading for a few hours, then decided we might as well do that in the air conditioning of the airport. We had to sit around for nearly an hour til we were able to check in, but in that time I was able to get changed and find a post office for a couple of postcards to send back to China. After a litte trouble at quarantine (pillows needing to be fumigated or something) we stepped out of Sydney airport into a BEAUTIFUL “winter” day. It was 23 degrees and I quickly got rid of my cardigan. We went to Carla’s old place so she could collect stuff for the move into the new place the friend she’ll be living with had found for them that week. I stayed out on the driveway soaking in the sun and the cornflower blue sky. I’m pretty sure Carla thought I was a little nuts. But after a month of awful smogginess in Beijing, I couldn’t think of a better place to be. A friend of hers came round and we took our stuff to her new place, where I quickly ended up in front of the news soaking up the Aussie accents and talking to some random guys (well, random to me) who were helping her friend move in. ← Tanya is back in Canberra!